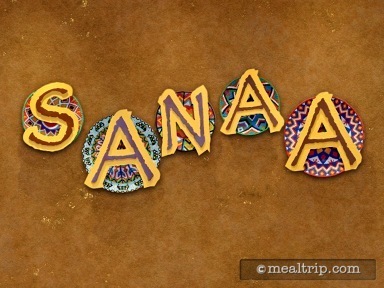 Sanaa is on the Kidani Village side of the Animal Kingdom Lodge and is the only restaurant on that side of the resort complex. The design of the eatery is quite unique, with floor to ceiling windows that look out over the Savanna. Guests are at the same level as gazelles, zebras, giraffes, kudu, ostriches, cranes… all of which are roaming around as you dine! There is a lot of styling and design detail inside Sanaa as well… almost as much as a signature restaurant. There are tree-like canopy drop-downs from the ceiling along with some tandoori-style faux thatched roofs over some of the booths in the back of the room. The textured neutral flooring makes a great base for the burnt orange, brown and tan tones, with red and blue accents here and there. 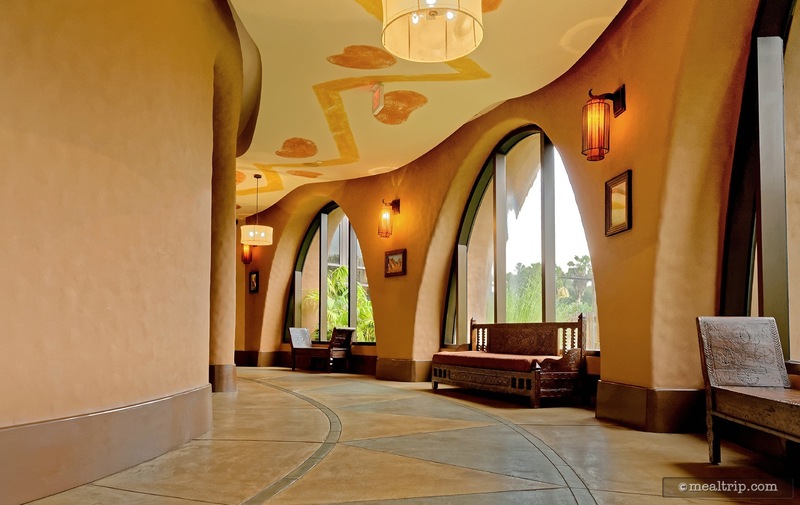 Keep your eyes out for hidden Mickey's as well, There are quite a few in the design elements at Sanaa. It's really great that there's a lunch period at Sanaa. The prices are a bit more affordable than dinner and it's a great way to get a feel for the quality and kinds of food that are available. One of the most popular items on the "starters" section of the menu is the Indian-style Bread Service, which for just north of $10 gives you a choice of three breads (Traditional Naan, Garlic-Ginger Naan, Spiced Naan, Onion Kucha, or Paneer Paratha), and three accompaniments (Red Chile Sambal, Cucumber Raita, Coriander Chutney, Mango Chutney, Tomato-Date Jam, Garlic Pickle, Spicy Jalapeño-Lime Pickle, Roasted Red Bell Pepper Hummus, or Tamarind Chutney)... and it's something that everyone at the table can not only share, but discuss the various flavor combinations. If you're unsure about what anything is... we've always found the staff here at Sanaa to be very well informed about the foods being served. Entrees include a Tandoori style shrimp or chicken sandwich, served open-faced, a Peri Peri Chicken Sandwich and the Sanaa Burger which combines a great meat burger with spiced mustard, goat cheese, pickled shallots, and piquante peppers all served on a naan bun with roasted potatoes and a pickle spear. Also very popular is the "Slow Cooked in Gravy, Simple and Well Seasoned" entrée which which give you a choice of two of the following… chicken with red curry sauce, shrimp with green curry sauce, paneer cheese and spinach, or beef short ribs… along with a dish of basmati rice or five-grain pilaf. Desserts here are mostly of the "small fancy" variety, but there's also a banana cheesecake, a Stone Fruit Samosa, and the Shahi Tukra which is an Indian-style bread pudding with chile vanilla sauce.